But the reality is that the Republican electorate, on the whole, has a favorable view of clean energy. A 2016 poll by the Yale Program on Climate Change Communication found broad support for government policies to expand renewable energy and reduce greenhouse gas emissions, with 84 percent of all registered voters in support of more funding for energy sources like wind and solar, including 75 percent of Republicans. The bipartisan embrace of clean energy is playing out in California, where a recent study by the Denver-based energy information company SolarPulse found that people in Republican-leaning communities are five times more likely to purchase rooftop solar than people in communities that vote Democrat, as ThinkProgress reports. 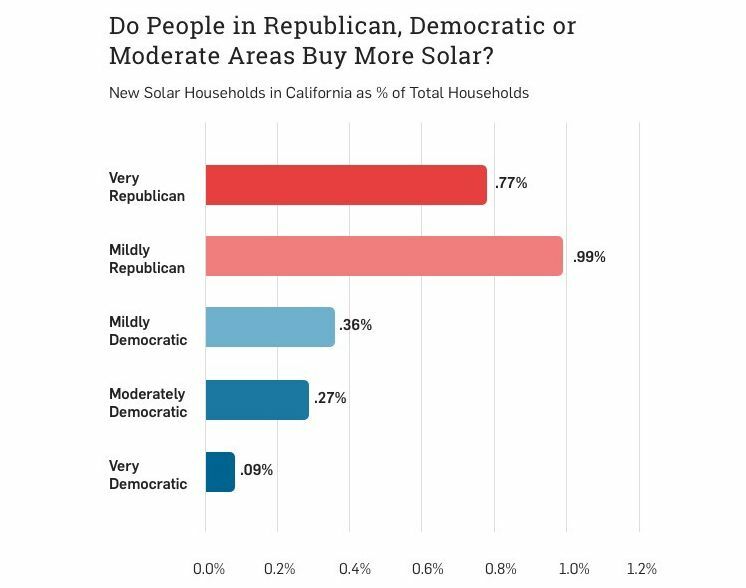 In the last five years, more than one in every 100 households bought solar panels in areas that elected Republicans. That compares to one in every 500 households with solar in areas that elected Democrats. Researchers then tested partisanship effect on solar purchases using the Cook Partisan Voting Index (PVI) -- which scores the representatives of each congressional district based on the partisanship of their voting record -- and divided areas as either Very Republican, Mildly Republican, Mildly Democratic, Moderately Democratic, or Very Democratic. Income did not prove to be the differentiating factor between political groups, given that the median per capita income in Democratic areas is roughly $8,000 higher than in Republican ones. The SolarPulse report found that home ownership is a driver, however, given 50 percent of California Democrats are renters compared to 40 percent of Republicans. Renters are far less likely to make a long-term investment in a home project like rooftop solar, and solar companies want stable solar purchasers. But the biggest factor proved to be geography, according to the report. Republican districts are typically located in the southeastern part of the state, where there are stronger solar resources and people are more likely to own large suburban homes that are better suited to host solar systems. 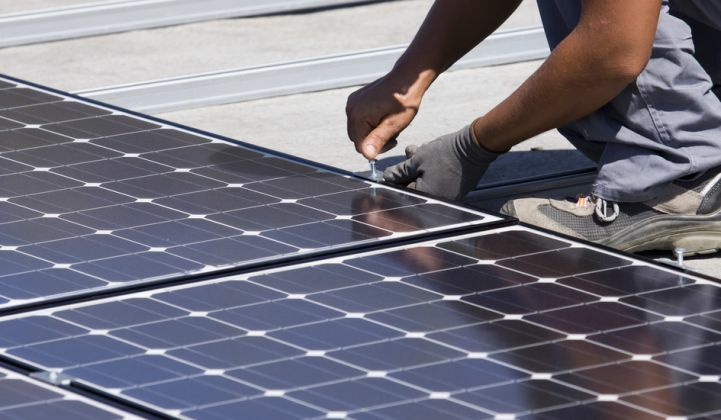 “When you start to look at how the installation of solar panels can translate into your individual electricity bill and what that can mean for your family, especially in California where you deal with above-average per-kilowatt-hour electricity costs, I think that can trump any political persuasions you may have about solar and renewables,” Paul Zalewski, director of digital marketing for SolarPulse, told the San Diego Tribune. Clean energy isn’t only attractive to Republicans in progressive states like California. 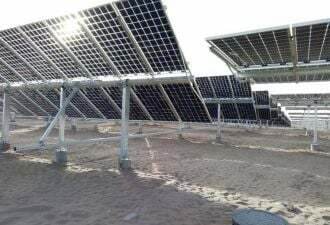 Solar has strong support from Republicans in Florida, Arizona, Nevada and several other states. Even staunchly Republican states like Oklahoma, Senator Inhofe’s home state, are starting to embrace solar power. Wind energy also has a very high approval rating among conservative voters. Texas, one of the reddest states in the nation, is currently at the forefront of wind energy generation in the U.S. In coal country, much of the hostility toward renewable energy is misplaced. Market forces -- predominantly the increased availability and plummeting cost of natural gas -- have led to the coal industry’s decline. Meanwhile, efforts are underway to retrain coal workers to participate in the growing renewable energy sector. The same is true for the oil and gas sector, which has been under pressure from low commodity prices. In actuality, U.S. solar jobs are growing 12 times faster than the overall economy, and last year provided more jobs than oil and gas extraction for the first time. Wind turbine technician recently became the fastest-growing job in the country, according to the U.S. Bureau of Labor Statistics. The International Renewable Energy Agency projects there could be as many as 24 million clean energy jobs worldwide by 2030.